Here is the situation...I had egg yolks left over after making my gluten free angel food cake to take to a friends house on Sunday. Between the cake and the 7 minute icing...I had quite a few egg yolks to deal with. I don't throw food away. It is a rule here. I will suffer through it even if it is not great to not throw it away. So, with egg yolks waiting for culinary greatness, I was off with my thoughts. I started thinking about what I have been craving lately. German chocolate cake with coconut icing (yes, please, but Jay won't touch it), ice cream (yeah, but I just did that), boston cream pie...we have a winner! Well, a take on it anyway. We took the boys to Krispy Kreme the other day. We don't do it often, but sometimes, ya just gotta live a little. Neither the illustrator nor I can eat there, but the boys love it and it is a treat for them. My dad used to get us doughnuts on Saturdays and I still remember my favorite was the boston cream pie doughnut! How could you not love a fluffy pillow of pastry filled with pastry cream and covered in chocolate? Well, Jay got one and fell in love. So, I decided to surprise him with a different take on his doughnut love. You know I love making a healthier version of unhealthy foods! So...let's get to work! This mixture took me right back to culinary school! I LOVED my pastry class and I remember to this day the first time I made a pastry cream. I am completely fascinated with the pale yellow color and the velvety texture the egg yolks and sugar become. Here is the mixture about to heated to make the magical topping! Be careful when you temper the eggs and milk Do it slowly, otherwise, you will end up with sweet scrambled eggs. Which Jay seems to like after discovering French toast is made with eggs, but that is not what I would looking for here. Creamy, smooth and sweet with a hint of vanilla! I used the waffles from the other day (thanks Jessica! ), topped them with vanilla pastry cream and then drizzled everything with some melted chocolate! In a small sauce pan, heat the almond milk to a boil. Remove the milk from the heat and set it aside. In a mixing bowl, whisk the egg yolks and sugar until it is fluffy and pale yellow. Next add the cornstarch to the egg mixture and whisk until there are no lumps. 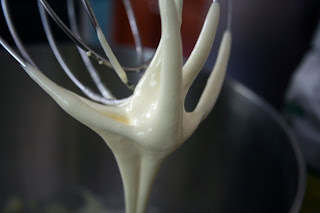 Now, whisk a little bit of milk into the egg mixture and mix completely. 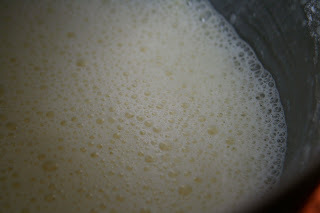 Slowly pour the rest of the milk into the egg mixture while it is being whisked. Next, pour the egg mixture through an strainer back into the sauce pan. Cook over medium heat, stirring constantly, until it comes just to a boil and it has thickened. Take off the heat and stir in the stevia. 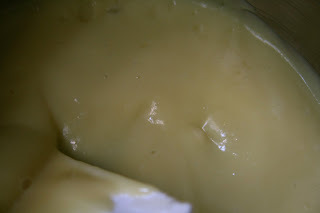 Pour into a container, cover the top of the pastry cream with plastic wrap sprayed with a little cooking spray(directly on it so it does not form a skin). Allow to cool. If you are going to use it immediately, just leave it out. If it will be a while, refrigerate it and remove it about an hour before using. Microwave for 35 seconds and stir to combine. If you need a little more heat, microwave for 15 more seconds. Watch it so it does not boil over! What favorite childhood junk food flavor do you make healthy now? Oh my gosh does that look incredible!!! Girl you just put my pancakes I made this morning to shame. But that's ok- becaues those waffles look freaking amazing! This is such a fantastic idea! I love it! I am a huge fan of Boston Cream Pie and, of course, adore waffles. So fun! Sarena!!! These look insanely delicious! Oh my goodness, this is SO decadent!! YUM! you are so clever - love it! and the photos are beautiful. WOOOOOWWWWWW These look amazing! I'm definitely making this for my next waffle gathering (because apparently I can only watch early world cup games on weekends with waffles). That is such a genius idea! I used to absolutely love the original glazed donuts on cold, snowy days. my mouth just watered. i'm not even kidding. wow. Now that is one awesome breakfast!!! You probably won the world's coolest mom award today, huh? Holy freaking moly! I'm coming over for breakfast tomorrow, okay? yum! 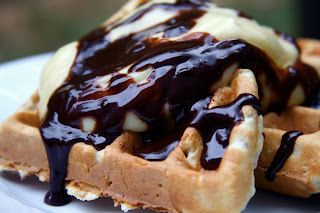 i've never had anything boston cream pie...i think i need to try these waffles asap! i missed doritos cheesy coating and so i recreated it in a healthy raw vegan dip yesterday! 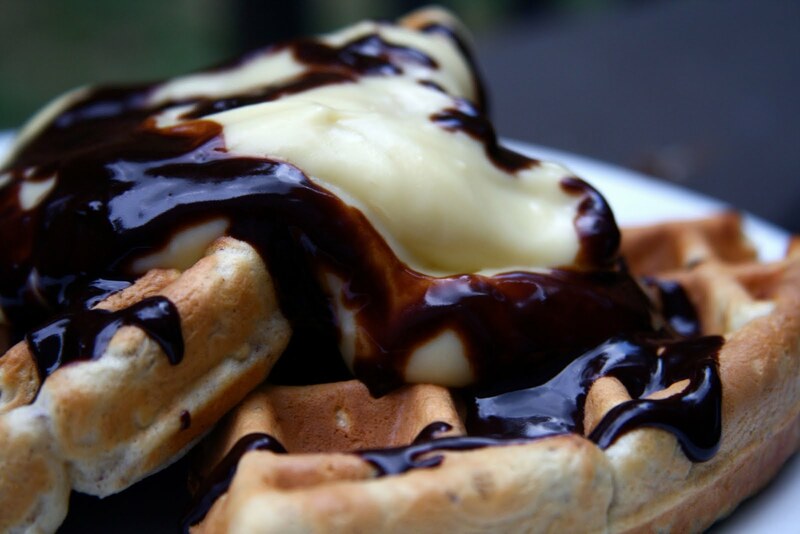 and of course that vanilla creme layer on those waffles...omg that loooks insanely amazing!!! Mmmmmm wish I could have this for breakfast! BakingNotWriting - Hi! I just wanted to let you know that I do think this would work with lactose free milk, but I really think you need the cornstarch to make a nice thick custard. You could also use flour, but I made it gluten free for my husband. I think it would be too runny otherwise. Let me know how it turns out for you! Have a great weekend!